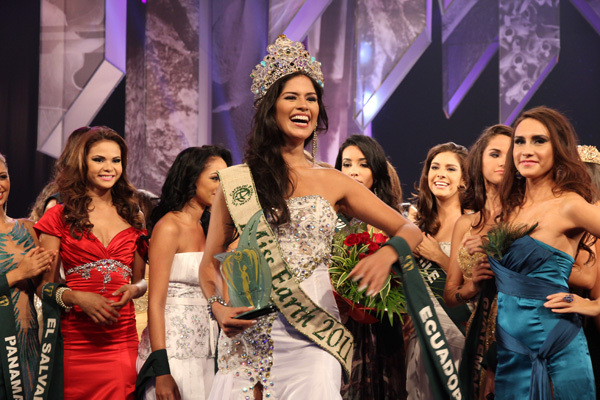 The representative from Ecuador, Olga Vargas Alava was crowned Miss Earth 2011 by former Miss Earth 2010 Nicole Faria after besting 15 other finalists during the pageant’s coronation night. The 11th edition of Miss Earth beauty pageant held at the University of the Philippines Theater in Diliman, Quezon City, Philippines on 3rd December 2011. Olga Alava is the first beauty from Ecuador to win Miss Earth. Olga Alava also won Miss Runway title. Drielly Bennettone (Miss Brazil) was crowned Miss Earth Air 2011, Athena Mae Imperial (Miss Philippines) was crowned Miss Earth Water 2011 and Caroline Medina (Miss Venezuela) was crowned Miss Earth Fire 2011.